Honestly this is all basically as expected. But of course you still have people yelling about Sony or IPhone. AnonD-77380, 18 Jul 2014The sensor is 13mp... lens don't have megapixel ratings. XD Maybe Oppo used much better len... moreHahaha nice point, my mistake, but still. Disappointed, i am. Maybe Oppo used much better lens than Sony or tweaked the photo algorithms better to get better shots than Sony. I don't know what to believe, i thought the z2's camera was pretty good after reading that z2 and s5 were at the top of the chart at DXOMark's camera ranking..
AnonD-274519, 17 Jul 2014I have an M8, the camera really isn't good. Other than that it's a great phone, but it's not t... moreI disagree with both of you. Obviously them the most. I think it's a good camera. The tech is good and the software on it is set fairly well. It's kay not amazing. Please, PLEASE. Where is Vivo Xshot in this review ? Becouse its the best camera phone around ? Nokia Lumia 1020 all the way as expected. The photos are unmatched. Though theoretically it isn't the flagship anymore, the Lumia 930 should be the one to be in the test to give the others a chance too. The 1020 just blows the rest away. What about Galaxy K Zoom??? 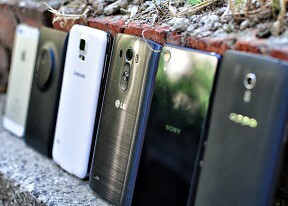 "A solid still camera and great video camera make the Samsung the top all-rounder of the group." Anonymous, 17 Jul 2014in my opinion htc one m8 have the best camerAI have an M8, the camera really isn't good. Other than that it's a great phone, but it's not the best camera phone. Guys how many times to tell you to skipping sony cam application and use Google cam...this will push z2 to no.1. Kindly review with Google cam apk...this results need revision with z2 google cam..
Would have loved to see OnePlus One in this. [deleted post]Exactly true..most use of camera atleast for me is in public webs..m8 has most amazing options for huge effects and unique shots..
Maybe not good in zoom but in normal situation i pick up it over any camera..
Not letting the M8 into the test is really a disappointment, this camera beats most of the others here in low light photography for example. Why you dont put the lossless zoom of the 1020 vs the rest of the phones? Another interesting thing, is ear the audio in a Disco or similar enviroment of the 1020 vs the rest.. Every ones needs to ear the difference..
AnonD-130880, 17 Jul 2014go and get an eye check immediately lumia 1020 always has the crisp, brighter image with a l... moreYou do realize that "crisp, brighter image" = heavy post processing! And about RAW, 808's pics are basically raw files, since they are absolutely untouched by post processing! I don't need to get my eyes checked. They are perfectly alright! And about the OIS part, I did say "Sans OIS". IE if we keep the OIS part out of consideration, then 808's videos are much better!